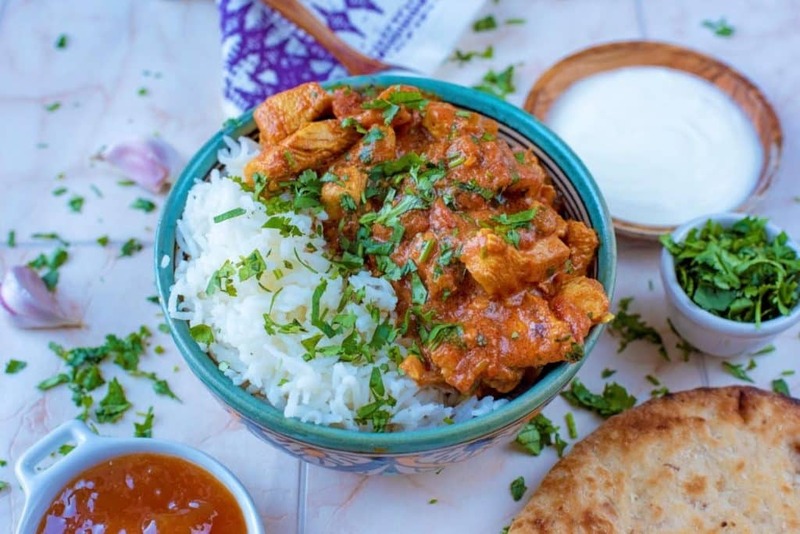 If you are looking for a new way to eat lean chicken breast, but you don’t like spicy food, then give this Tomato and Garlic Chicken Curry a try. It’s a rich and creamy curry with just a tiny bit of spice, which could easily be left out to make a lovely mild healthy chicken curry. One of our aims for this year was to order less takeaways and cook more alternatives at home. This easy chicken curry is our go-to on a Friday night rather than ordering from the local Indian restaurant! 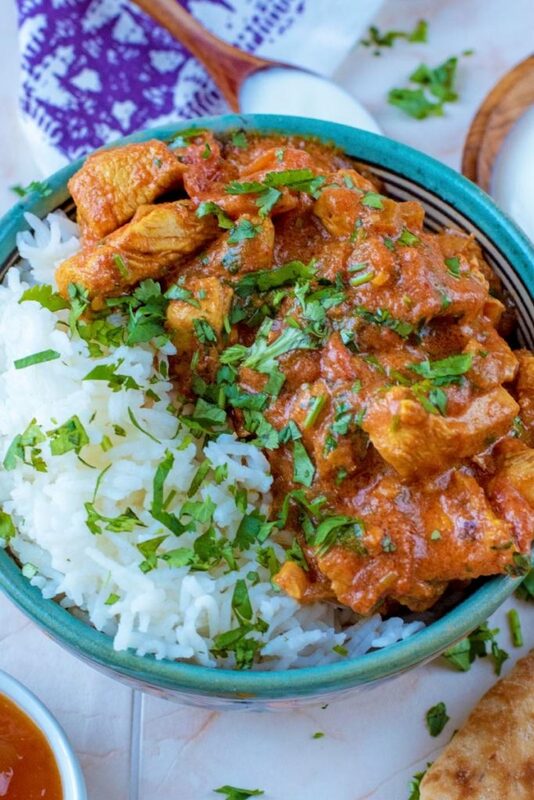 It has all of the flavour of a takeaway tomato based chicken curry, but much less calories. Check out our Healthier Takeaway section for more recipes. This easy chicken curry has plenty of flavour going on, but we kept it mild as I know not everyone wants to be blown away by a curry. It’s really all about the spices, rather than the heat. There is cumin, coriander, cinnamon and of course lots of garlic, but just a sprinkle of chilli flakes which could easily be left out. I love a spicy curry and although I have a limit, usually it’s the spicier the better. However, Avery (our one year old daughter) doesn’t quite have the same spice tolerance as I do. Yet! She does love a curry though! 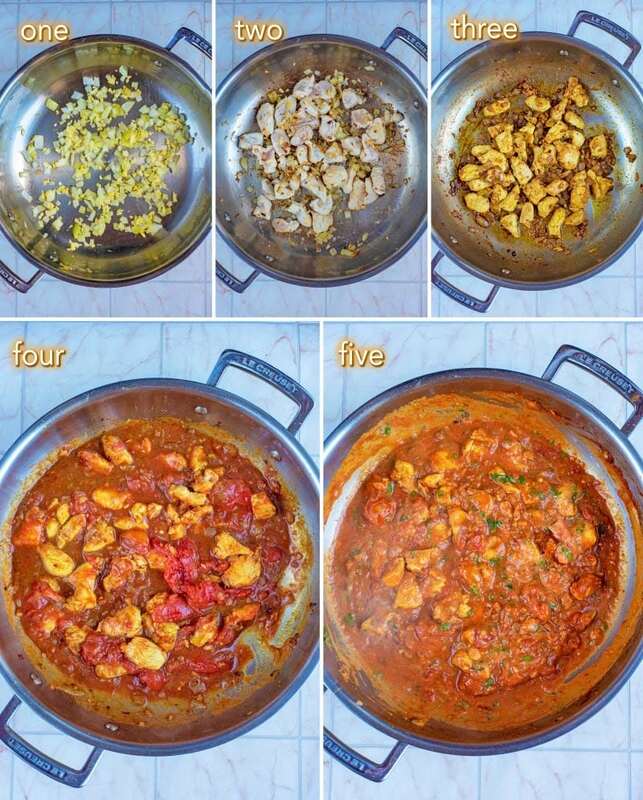 Curries are great way to introduce kids to new herbs and spices and you can easily sneak some vegetables in to this too. This has become a family favourite, so we keep it pretty mild and then I add an extra sprinkle of chilli flakes to my bowl before serving. Avery has also developed her parents love of garlic, so anything that is heavy on garlic gets a big thumbs up. Or insane arm flapping, as she hasn’t mastered thumbs up yet. This isn’t one of those 30 garlic clove recipes (even I don’t like garlic that much), but it does have a good punch of garlic flavour. What’s the point of having the word garlic in the title otherwise? We all like a big indulgent takeaway curry every now and then, but that was becoming a bit too much of a habit for us, so we started making more healthy chicken curry at home. It doesn’t get much easier than this, and it’s pretty low in calories too at just 386 calories a bowl (without rice). Curries usually come with ghee or cream stirred through it, but we added some Greek yoghurt to give it that delicious creamy flavour without all the calories. Then there are all the healthy benefits from all the garlic in this! As with all our recipes, this is easy to adapt. We have had this as a vegetable curry when we needed to do a fridge clear out, we have had it with tofu and we have done a seafood version too that was really good. Our aim is to provide you with base recipes, like this sauce, that you can then adapt to suit your family’s tastes and also so you can enjoy it again and again without getting bored. This low calorie and low fat curry is a great way to cut back on takeaways and without cutting back on flavour. It has all the spices you know and love from your favourite curries, without the heat, making it a curry suitable for the whole family. One: Put the olive oil in a large pan and then add the onion, garlic and ginger and cook for 3 minutes until softened. Two: Add the chicken and cook for a further 3 minutes until browned. Three: Once the chicken is browned, add the red chilli flakes, cumin, turmeric, cinnamon and coriander to the pan and mix well and cook for a further 1 minute. 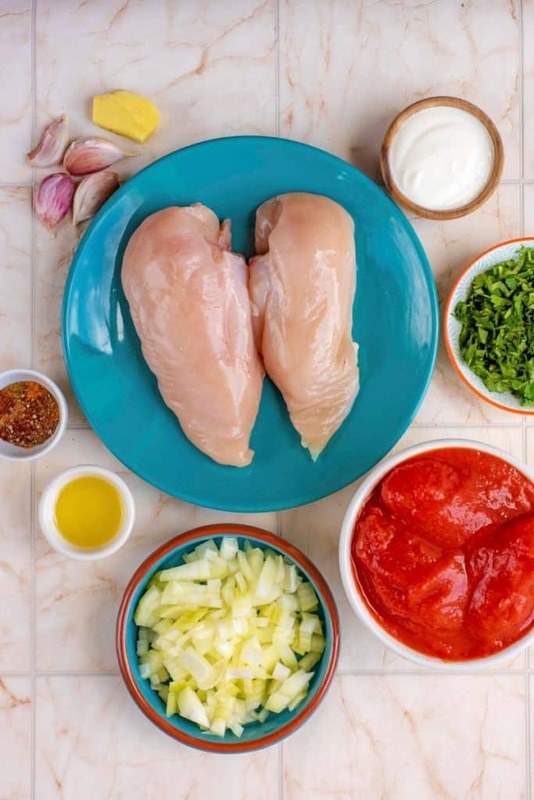 Four: Add the chopped tomatoes and tomato puree to the pan and gently simmer for 10 minutes until the chicken is cooked through. Five: Stir in the Greek yoghurt and coriander before serving. If you like your curries spicier, add an extra sprinkle of chilli flakes before serving. Make the curry a little more indulgent by stirring some cream through just before serving. Add a portion of vegetables to this easy chicken curry by throwing in some chopped spinach a few minutes before the curry is finished. Don’t like chicken? You could use any vegetables instead, or use tofu or king prawns. 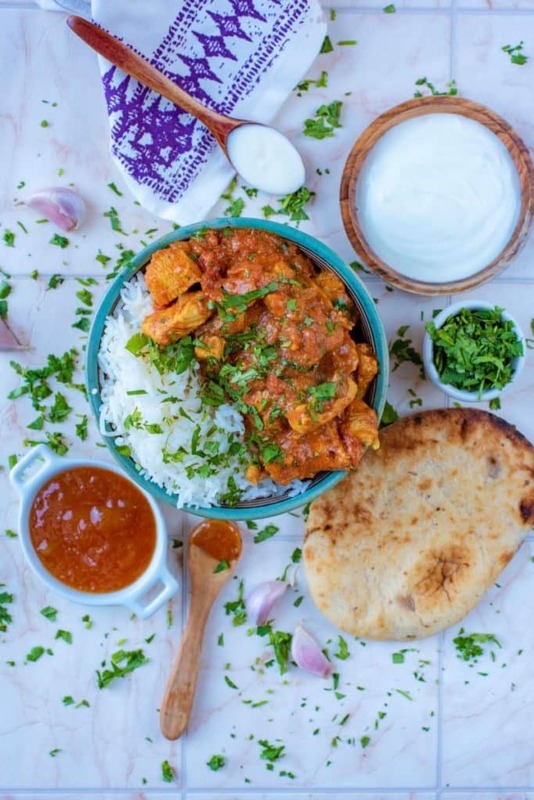 Do you want to be kept up to date on more delicious posts like this Tomato and Garlic Chicken Curry? Please subscribe to the blog mailing list (it takes 30 seconds). 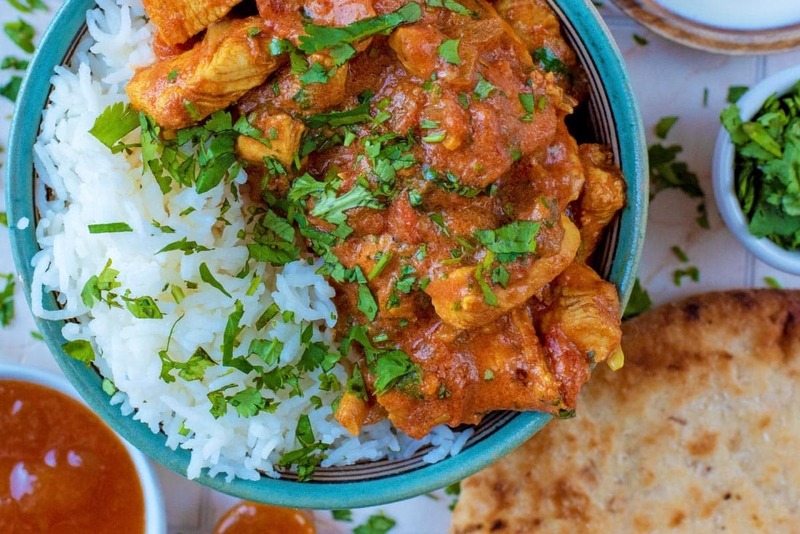 If you’ve tried this Tomato and Garlic Chicken Curry, or any other recipe on the blog, then let us know how you got on in the comments below, we love hearing from you! You can also FOLLOW US on FACEBOOK, TWITTER, INSTAGRAM and PINTEREST to see more delicious recipe ideas, behind the scenes shots and also what we are getting up to. 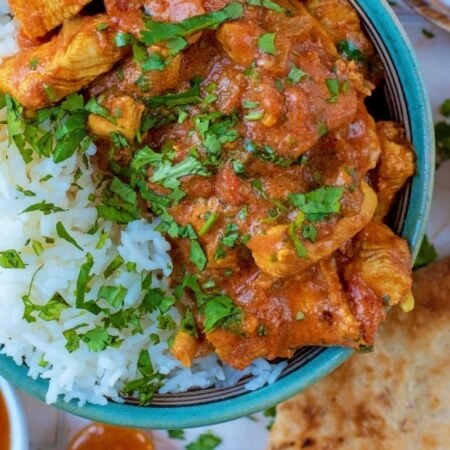 If you are looking for a new way to eat lean chicken breast, but you don't like spicy food, then give this Tomato and Garlic Chicken Curry a try. Add the olive oil to a large pan and add the onion, garlic and ginger and cook for 3 minutes until softened. Add the chicken and cook for a further 3 minutes until browned. Once the chicken is browned, add the red chilli flakes, cumin, turmeric, cinnamon and coriander to the pan and mix well and cook for 1 minute. Add the chopped tomatoes and tomato puree and gently simmer for 20 minutes until the chicken it cooked through. Stir through the Greek yoghurt and coriander before serving and serve with rice. Don't like chicken? You could use any vegetables instead, or use tofu or king prawns. Made it with a mixture of salmon and prawns instead of chicken and it’s wonderful! Next time I am going to make up some of the sauce and freeze it in portions! Ooh, that sounds like a good swap! I am going to try that soon! Absolutely delicious, better than a takeaway! I’m not a curry fan, however my husband and 6 year old son are. This looks perfect for batch cooking. Is it freezable? Perhaps leaving the yoghurt out until serving? Hello! Yes, this freezes well – just stir the yoghurt through before serving. It’s such a good idea to make your weekend takeaway a fakeaway at home. So much healthier, cheaper and not to forget tastier. Good plan! I absolutely love chicken curry. Thank you for such a great recipe! 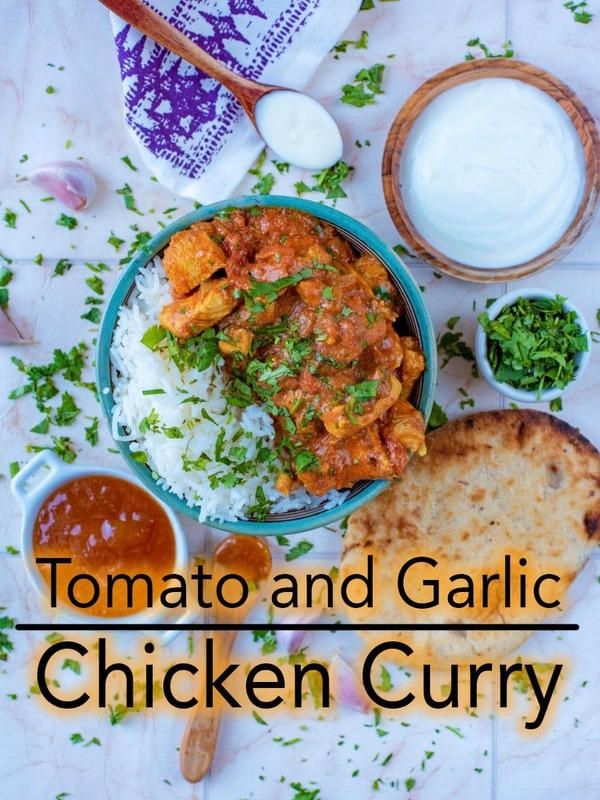 I love Curry, I usually have mostly eaten Golden Curry (Japanese Curry) in the past and I am always thinking I want to try a different style so this recipe for Tomato and Garlic Chicken Curry is on our list to make for dinner tonight. I went out and got all the ingredients. Wish me luck! Tomato and garlic are wonderful flavors for curry. Thanks for this delicious recipe! Garlic is always a winner in my book too! I love Indian food and this looks wonderful! I am trying to get my kids used to spicy meals and this recipe looks like the perfect place to start. I might even use a little less of the spices to make it milder. Thanks for the tips!